Apparently I enjoy turning holiday drinks into desserts; I keep learning new things about my cooking style everyday with this food blog. The last recipe I posted was for Spiced Hot Chocolate Peppermint Cookies, a culinary twist on a beloved beverage. In an effort to be creative with my recipes, this is what you get. With Christmas coming soon, apple cider and eggnog drinks will most likely be enjoyed. This Apple Cider Cheesecake with Brown Butter Apple Compote is a perfect complement. 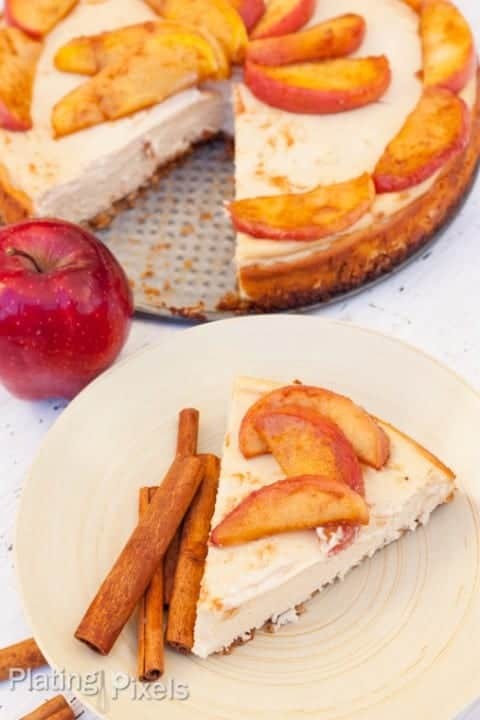 I don’t exactly remember how the recipe idea came to me, but I was talking to Olia, and it was something like this…“Hey, wouldn’t it be cool to take instant apple cider drink powder and add it to a vanilla cheesecake?” Bam! Simple as that, a holiday twist on cheesecake is born. I honestly don’t know if this is out there already, and haven’t checked. I prefer to stay blissfully happy about my creation. You’ve never had a cheesecake like this. It literally tastes like an apple cider, and almost has a bit of caramel undertone. 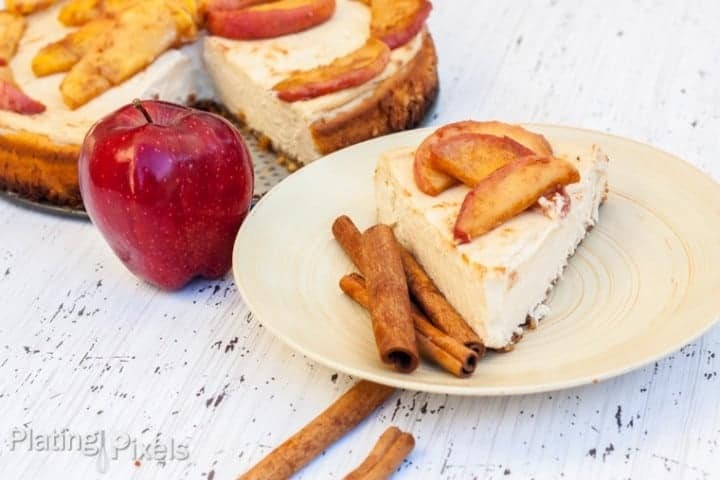 A few packets of instant apple cider perfectly flavors the vanilla cheesecake. On top of that, no water bath is required for this recipe, so it’s pretty easy to make. 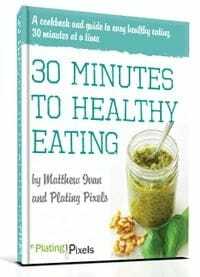 A toasted nutty gluten-free walnut crust helps to keep this recipe safe for dietary lifestyles. To top off this rich and creamy cheesecake, a simple Brown Butter Apple-Cinnamon Compote is added. 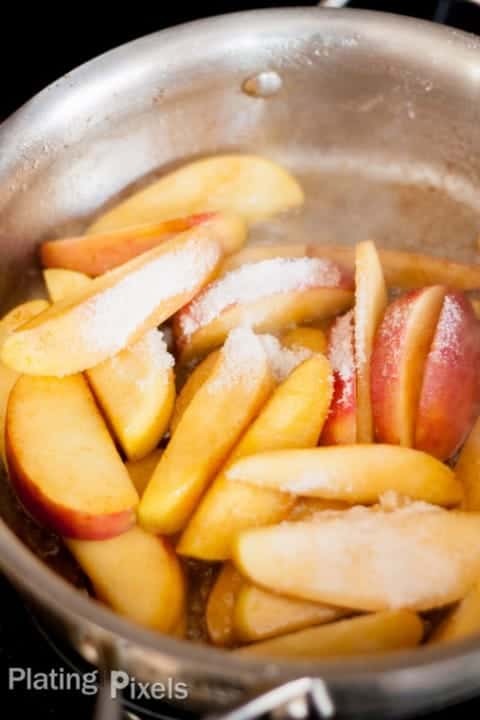 Heat apple wedges, sugar and cinnamon in a bit of browned melted butter to flavor and slightly soften the apples. I truly hope you have a wonderful holiday season and please do enjoy this Apple Cider Cheesecake with Brown Butter Apple Compote. Cheesecakes are more likely to crack when cooling if you overbeat the eggs when making the filling. It incorporates excess air, which causes the cheesecake to puff up when baking. As it cools, it falls and cracks. I shot this in natural light at 1/100 sec, f/ 3.5, ISO 800. 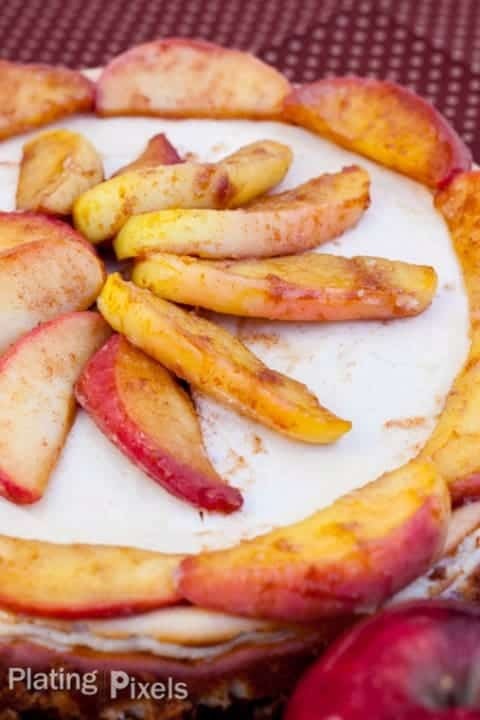 The wedges of the apple compote create a beautiful topping. Whether preparing for food photography (unlikely for you as the reader) or serving this to your guests, take the time to carefully arrange them on the top. I chose to create a radial pattern in the center and an even ring around the outside. It really does set it to another level. I bright red apple and some cinnamon sticks (not used in the actual recipe) create a story for the recipe. An almost birch-like background of wrapping paper give a rustic, yet classic look. 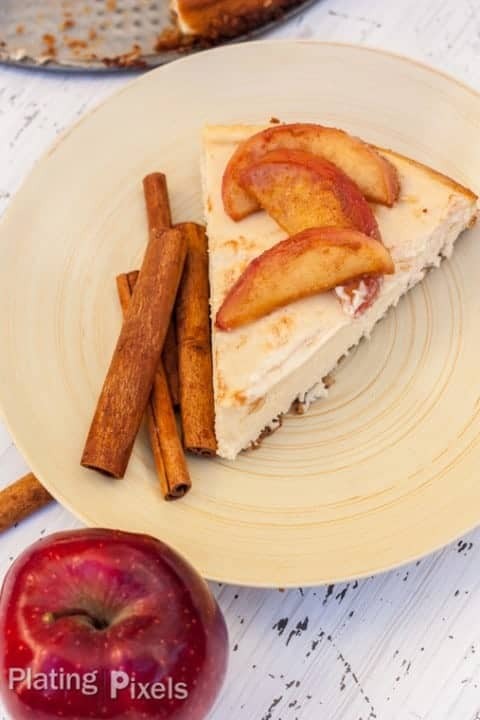 Apple Cider Cheesecake with Brown Butter Cinnamon Apple Compote. 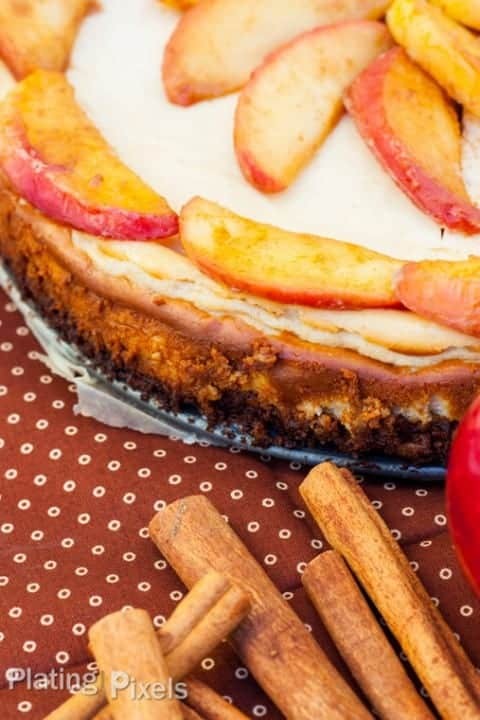 Instant apple cider perfectly flavors a cheesecake. A walnut crust helps keep this recipe gluten-free. Preheat oven to 325ºF. Combine walnut crumbs (see cooking tips section above) with melted butter and sugar. Evenly pat into bottom of a 10-inch round springform pan. Bake for 8-10 minutes, or until just golden brown. Take out to cool. Change oven temperature to 350ºF. Allow cream cheese and eggs to sit at room temperature for 30 minutes. In a large bowl, beat softened cream cheese and sugar with a mixer on medium high speed just until fluffy and smooth. Add flour, beat on low until smooth. In separate bowl, lightly beat eggs with fork. Add eggs and vanilla to cream mixture and beat until just combined. Gently stir in sour cream and apple cider powder. Pour batter into pan with baked walnut crust. Place into a shallow baking pan in oven and bake at 350º for 40-45 minutes, or until a 2 ½ inch area around the outside edge of cheesecake appears set when gently shaken. Cool on a wire rack for 15 minutes, then run a sharp knife around the outside of the cheesecake (this helps prevent cracking as it cools and shrinks). Cool 45-60 minutes more, then cover and place in fridge for at least 4 hours to completely cool and set. Top with Apple Compote below. Melt butter in a large frying pan over medium heat. Continue to cook butter for 3-4 minutes, or until golden brown in color. Add apple wedges, sugar and cinnamon. Carefully stir to evenly coat. Cook 5-8 minutes, stiring occasionally, until apples are softened but not mushy. Remove from heat, cool slightly and evenly top cheesecake. – Vanilla cheesecake base adapted from Baking Secrets. Print. 2014. I never thought to try a fall themed cheesecake before. I bet this is so good! Well now you have one you can try 😉 Thanks! Well this looks amazing! 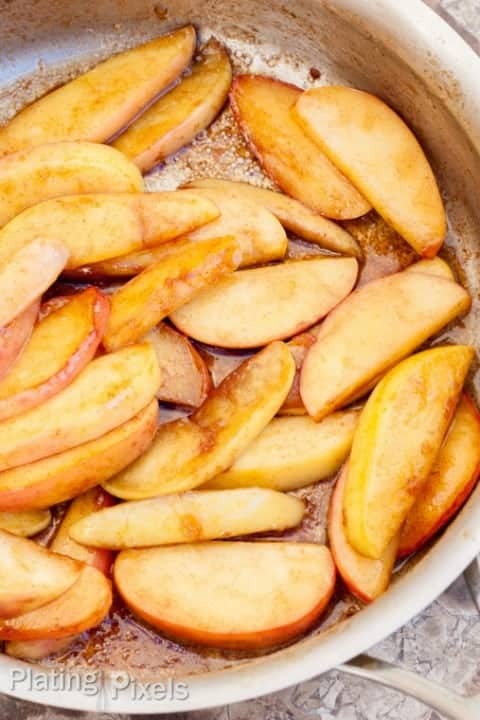 I love brown butter, so I have to try that compote! You totally should. Thanks Valerie! Wow! This looks so amazing and I could make it for my Mom since it’s Gluten free! I bet she’d love it! Thanks Shaylee! I love your food styling and photography tips! This recipe looks so good! Adding to my list of treats to make! Thanks so much Brittany! Glad they’re helpful and hope you enjoy! This cheesecake sounds amazing! And, since it’s gluten free, I can make it for my family’s Christmas party. Can’t wait to try it! Thanks Robin! Glad you picked this recipe and hope you and your family really enjoy it! this sounds amazing!!! Would love to give it a try! Thanks Claire! You totally should.